Neutrogena have a range of exfoliating scrubs, and I chose the one which would control my oily skin, mattify and reduce shine. It’s the new Visibly Clear Pore and Shine daily scrub. I have very oily skin which can’t keep make up in place for very long. Despite trying various mattifying creams and primers, foundations and powders, I’ve found the most effective solution is a good scrub. I needed one which was gentle enough to be used every day, but could also keep oil at bay, and unfortunately this one doesn’t quite cut it. 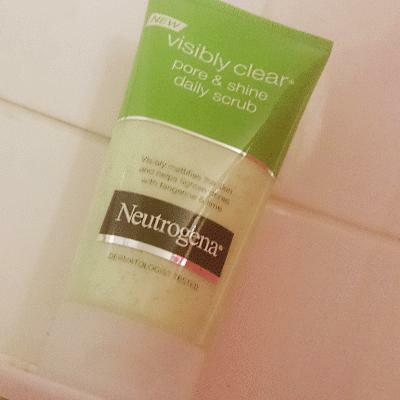 Whilst it felt and smelt nice on application, and the exfoliating beads do feel like they are removing dirt and dead skin, the Neutrogena Visibly Clear Pore and Shine didn’t have the longevity that I would have liked in terms of controlling oil and shine. I didn’t find that leaving it on for longer helped soak up excess oils, either. It certainly didn’t mattify my skin for longer than a few minutes, so it wasn’t a very good base for my make up. This exfoliator is probably best suited for those with normal to combination skin only, and best used as part of a skin care regime consisting of extra exfoliation, toning and moisturising. By itself it doesn’t work efficiently, which I suppose is reflected in the £4.49 price tag. It is disappointing considering all the hype there has been about this product, with loads of Neutrogena adverts to match, but for me it simply didn’t work.